…but there are two experiences: one which involves going to Level 124 for that observation deck known as At The Top, Burj Khalifa; and the other where you can visit the observation deck on Level 148 — currently the highest observation deck in the world — via a premium experience. 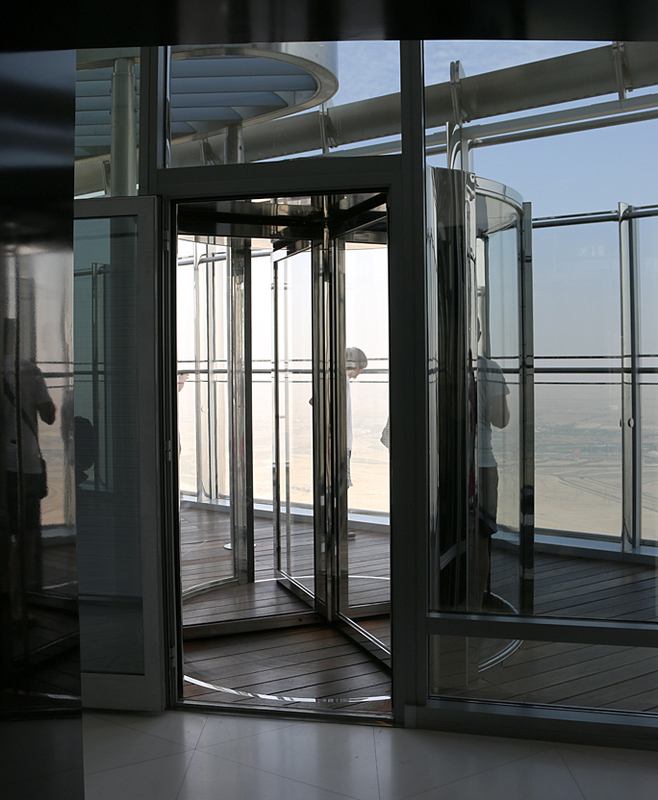 There is one issue, which is the major price differential between the two experiences: access to the observation deck on Level 124 can cost as little as 125 United Arab Emirates dirhams; whereas the ticket price to visit the observation deck on Level 148 will set you back as much as 500 United Arab Emirates dirhams. In other words, the ticket prices are approximately $34.00 and $136.00 respectively. Ouch. All right — for the sake of informing you, I decided to go against my better judgement and splurge the 500 United Arab Emirates dirhams on the premium experience known as At The Top, Burj Khalifa SKY. The good news is that since I was driving a rental car, it is nice to know that parking is completely free of charge; and I had no problem finding a parking spot at Section M of Level 1 inside of the Cinema car parking garage at the lower ground level of Dubai Mall — which at approximately 12,100,000 square feet is supposedly the largest shopping mall in the world based on total area; and was refreshingly air conditioned on what was a hazy, hot and humid day in Dubai. In fact, the worst part about driving a car to Dubai Mail is negotiating the traffic around the complex; but that really was not a major issue at all. Plenty of signage directing cars to the Cinema car park will ensure that you do not get lost. Dubai Mall did not seem to be larger than Mall of America in Minnesota, which I visited some years ago — but then again, I was not exactly armed with a tape measure with the interest of finding out for certain for myself. For the record, the high temperature that day was 108 degrees Fahrenheit. Break out the parkas and the mittens in preparation for that snowball fight, for that was considerably colder than the sweltering 118 degrees Fahrenheit — or 48 degrees Celsius — which Dubai was to eventually suffer through within the next couple of weeks. It can take approximately ten minutes to walk from the car park through the mall to the area where you can purchase your tickets; and there is a special desk for At The Top, Burj Khalifa SKY customers across from the main ticket counter for At The Top, Burj Khalifa. I reluctantly purchased my ticket and requested 5:00 in the afternoon as the time I wanted to ascend to the observation deck, as my plan was to view Dubai and its surroundings in full daylight — despite the brownish haze — and stay through sunset into the nighttime. Although you can only spend up to 30 minutes at the observation deck on Level 148, visitors then descend to Level 125 — one level above Level 124, where the observation deck is located for those who did not pay for a premium experience — for what is supposed to be a unique experience; and you can stay on that level for as long as you like until it officially closes for the evening. When the time arrived, I showed my ticket at the entrance, where I was escorted to a private lounge where dates and Arabic coffee were served. Once we were whisked up to Level 124 — not Level 125 — we were then escorted to another bank of elevators which took us up to Level 148. 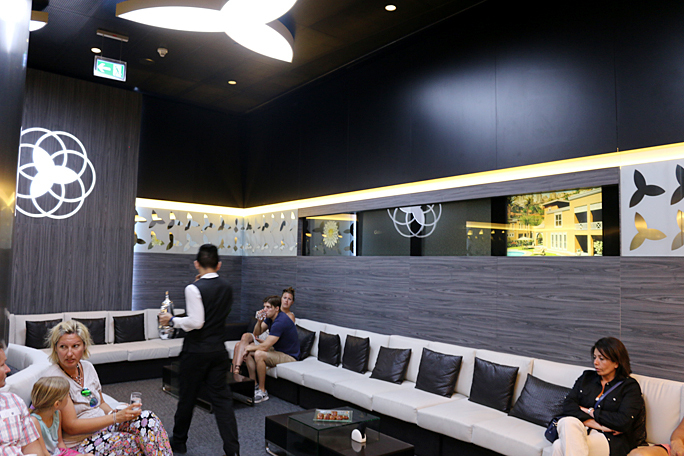 A stylishly chic lounge area — complete with waitpeople awaiting us with trays of drinks and small pastries — awaited us when we exited the elevator. As for the claim of the highest observation deck in the world, the official declaration is framed for all to see. There were plenty of couches on which to relax at any time; and there were also coffee tables on which to rest your drinks. Although the three different drinks — each comprised of orange juice, pineapple juice, and a limeade flavored with mint — were plentiful and deliciously refreshing, the pastries were few and far between. 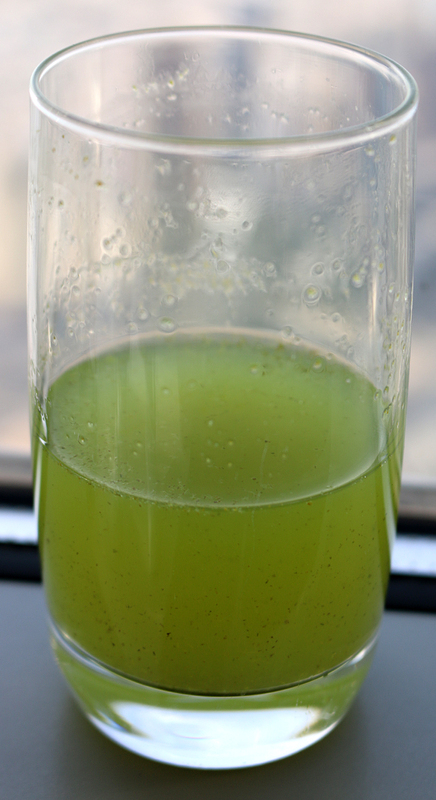 This limeade with mint may look unappetizing; but it was really tasty and refreshing. I could have kept drinking this if I could… Photograph ©2015 by Brian Cohen. The pastries tasted very good when I was able to sample them. More often than not, the tray would already be empty by the time I was able to get to one. 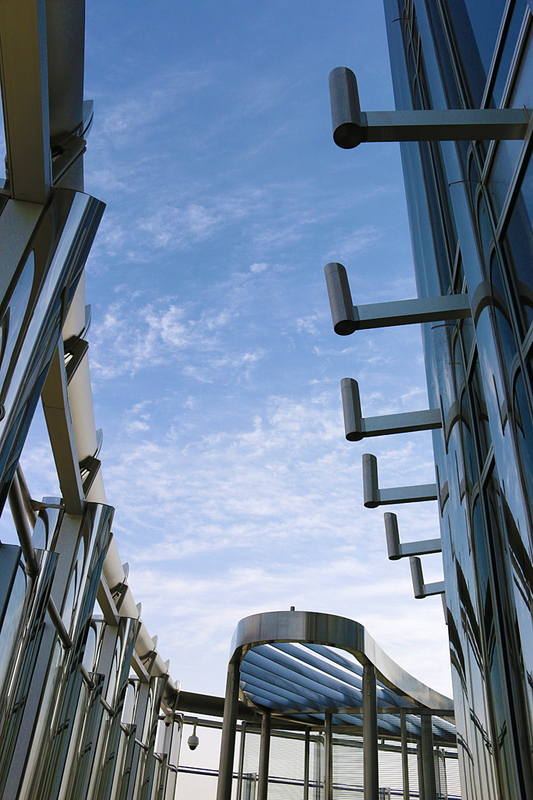 There was an outdoor part of the observation deck on which visitors were invited to enjoy. There were more people on Level 148 than I expected; but it was still quiet and relatively uncrowded. 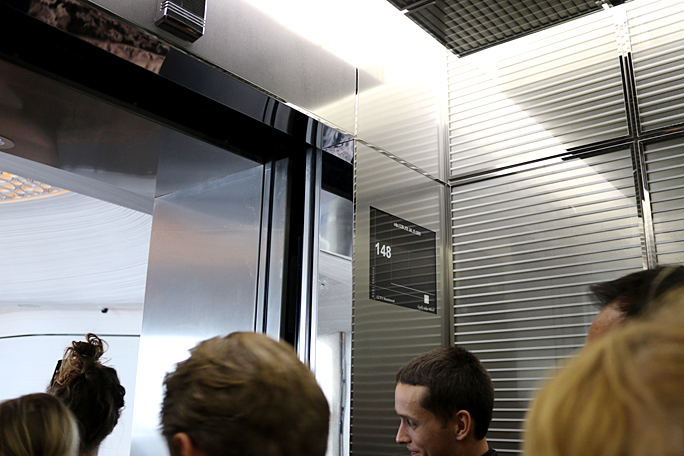 When it was time for me to leave Level 148, I awaited the elevator, which escorted me to Level 124 instead of Level 125; and Level 124 was indeed crowded. What a contrast to the experience on Level 148. I approached an employee and asked about Level 125, as navigating through the crowds on Level 124 was not supposed to be part of my experience. At 456 meters above the ground, and one level above the At the Top observatory, Level 125 offers you a spacious deck to enjoy the stunning 360-degree view of the city. This level also houses one of our newest attractions, Dubai – A Falcon’s Eye View that allows you to explore the city from a unique perspective. Enjoy personalised attention from Guest Ambassadors Learn fun trivia about Burj Khalifa and the Dubai skyline Capture your Burj Khalifa moments forever and integrate reality and special effects with green screen photography See prominent destinations in Dubai through Dubai – A Falcon’s Eye View experience. I did not get to experience any of that at all despite having paid a premium for that. Instead of a spacious deck, I got to “enjoy” the crowds on Level 124, which had very few places where a person can sit. I made the most of it — but I should not have had to do that. If I wanted to do that, I could have paid significantly less money in the first place. At no time was I informed that there were any “irregular operations” with the premium SKY experience, for which I paid an extra $102.00. As a result, I felt like I was cheated and deceived, which left a sour taste in my mouth of what otherwise could have been a pleasant and positively memorable experience at At The Top, Burj Khalifa. 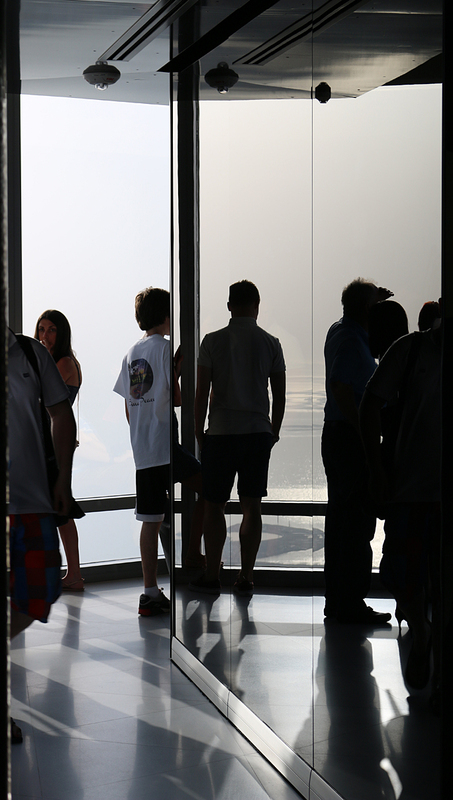 If you must experience an observation deck at Burj Khalifa, I recommend that you do not waste your money on SKY. For one, there is little value of what you get in return for your money with the minimally better view; not having to wait in line; and the ten dollars — I am being generous here — worth of pastries, juices, dates and Arabic coffee. 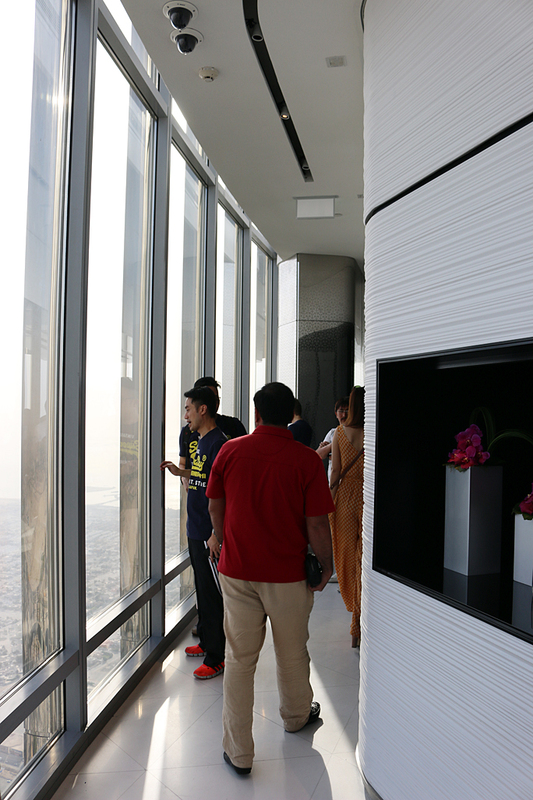 Go for the standard At The Top, Burj Khalifa experience instead if the line is not too long. Give yourself a minimum of one hour to enjoy the experience; and you can stay as long as you like until the official closing time that evening. Treating customers with deception even once — never mind on a regular basis — will cause customers such as I to be “one-timers”, as I certainly do not intend to return there. They should be ashamed of themselves for not giving customers who are paying premium fees important information which significantly affects the experience as advertised — or, at least, give the customers some sort of a discount as compensation. They chose to do neither. That is simply wrong and inexcusable. To ensure that my paying an extra $102.00 was worth it, all I ask of you is to avoid SKY and not pay that premium when you visit. Better yet, consider saving your money and not going at all if you are willing to wait for the observation deck at Kingdom Tower in Jeddah to open instead; and bypass Burj Khalifa altogether if all you want is to be in the tallest building in the world. As for the views itself from Burj Khalifa from both observation decks, I took plenty of photographs which I intend to post in a future article — but I did communicate my disappointing experience to the organization which operates At The Top, Burj Khalifa — and here is the official response which was sent to me and soured me even more. Parking is available free of charge at Section M of Level 1 inside of the Cinema car parking garage at the lower ground level of the Dubai Mall. The Roads and Travel Authority — or RTA — of Dubai offers bus service from the Deira Gold Souk on route number 27. The buses arrive and depart from P2 Cinema Car Park on the lower ground level of Dubai Mall every 15 minutes. Burj Khalifa can be reached via Dubai Metro at Burj Khalifa Metro Station. There is a check room to store baggage at At The Top, Burj Khalifa. All ticket prices are in United Arab Emirates dirhams. Admission is always complimentary for children younger than four years of age. From June 17 onwards, the prime hours are between 6:00 in the evening through 11:00 in the evening. Tickets may be purchased here up to 30 days in advance but with no discount — although you can reserve a time slot in advance before it sells out. Alternatively, tickets may be purchased at the ticket office near the entrance to At the Top on the lower ground of Dubai Mall. To enquire about school groups and education packages, click here, or contact the school of At The Top at Schools@atthetop.ae. If you paid by credit card you might consider protesting the charge. You did not get what you paid for and I agree that you were at least misled, if not cheated. That’s exactly why credit card companies have charge backs so that consumers can be protected. I don’t usually recommend this, but this seems to be a pretty clear case and you did try to resolve it onsite, but they did nothing. It was not just disappointing, but they failed to do specific things for which you paid. I am actually ambivalent on that advice, CarlH. I do agree with you on one hand; but on the other hand, I did get to go to Level 148, which is arguably the main focus of the experience. I too was nearly cheated. The ticket office tried to convince me that there were no general admission tickets available and told me to purchase the fast track ticket at three times the price. After holding up the line arguing, I was about to leave when suddenly he told me he could sell me some last remaining tickets at the regular price. Wow. I am sorry to learn of that, Tim. And just how am I, a non-Muslim American, supposed to visit Jeddah? If we can’t go there, why do we allow them to come here? Tom since you don’t know the difference between Jeddah and Dubai you might want to skip the middle east altogether. You’d probably make a horrible representative for the U. S.
Tom is right. Saudi Arabia does not offer tourist visas. For the vast majority of us, therefore, the tallest building experience option will remain the Burj. Although tourist visas for Saudi Arabia are not possible at this time, I am hopeful that they will be available by the time the Kingdom Tower is completed in 2018 and opened in 2019. That’s a pretty bad classic bait and switch. When I visited, the entrance lower lobby allowed us access 2 hours after our advance purchase ticket time (inbound flight delays). It seems the rules aren’t adhered too closely at this attraction. Hi very nice blog. Thanks for sharing it. Really there are so many beautiful places in Dubai and Burj Khalifa is one among them. Recently I visited Dubai take the travel service of altdubai.com. Because of this I could enjoy the awesome beauty of Burj Khalife heartly.It make my trip really very memorable. If you are planning to go Dubai then take the service of this. I am sure you will never be disappointed. Thanks for a fantastic balanced and clear blog explaining the experience you had, it is very helpful, but alas I read it after the fact! Today I had s trip up the Burg Khalifa with my daughters… We dived into a short queue for our 3 tickets and charged 1065AED… We got a cute cuddly toy version of the building as a gift and then pretty much experienced what you tell us above except that we got the full floor 125 that you missed. But I now understand what I did. Hey – I never got a cute cuddly toy version of the building as a gift, Mike! I am glad to learn that your most recent experience was better. Just went there recently on business and in a spare evening decided to go and have a look on the spur of the moment. There were no price lists on the desk so just asked for a single admission. Was charged AED 350, which is an off peak reduced price for the top level experience but was unaware of the cheaper lower floor option. After visiting level 148 I descended to levels 125 and 124. Apart from the fact that you are at the highest public level on 148, there was not enough to justify the extra cost of level 148 so I did feel a bit ripped off. In fact as you are slightly closer to the ground, the views are arguably better on 124 and 125 as you can see a bit more detail. Only pay for the premium experience if you particularly want to go to the highest floor that you can. I recently went on a mileage run to Dubai. I did knowingly pay for the SKY experience. It was chaotic on the ground floor and I had chosen an 8 pm tour and did not leave until almost 10 pm. It isn’t likely I will come back and don’t regret paying the premium cost. When you’re going to the tallest peak, you can’t expect to see much details but the night view was fantastic with the city lights below. I wanted full darkness so that it would be interesting to see the city. It’s a desert town, not much views to be had (stayed at the Conrad and the views were not interesting at breakfast). The pastries served where macaron and they kept coming out until no one wanted more so you could have had your fill. I find service perfunctory in Dubai if you have locals working. The immigrants (Indians and Filipinos) were much more people oriented and helpful in the shops. I experienced the views both during the daytime and nighttime, betty vu — and I need to post those photographs. Thank you for the reminder — and thank you for posting your experience, which sounds better than mine. You have described it so well and help me made my decision. I would be visiting Dubai next month. I had a minor confusion, if u cn help me with that. I am planning to buy Prime time tickets as I want to witness the sunset. However, since there is a difference in price for prime and non prime hours I was thinking to get a normal ticket for 5:30 pm slot and witness the sunset. I think that the time of year would depend on whether or not purchasing a ticket for 5:30 in the afternoon to witness the sunset is a good idea, Rakshita Kapoor. Because the sun sets earlier, now would not be ideal to implement that strategy. The people who set the ticket prices know exactly what they are doing. They have devised it so that you pay significantly if being at Burj Khalifa during the day and night is important to you. Floor 125 is the special designated floor for prime ticket holders. There is no special designated place on Floor 124 for prime ticket holders, which was part of my complaint about the experience. I will be visiting Dubai next month. Instead of visiting either observatory (Lvl 148 or 124), I am considering simply booking a reservation at the Atmosphere restaurant on Lvl 122. Does anyone have any experience with this? Mr. Cohen, you are quite comical. 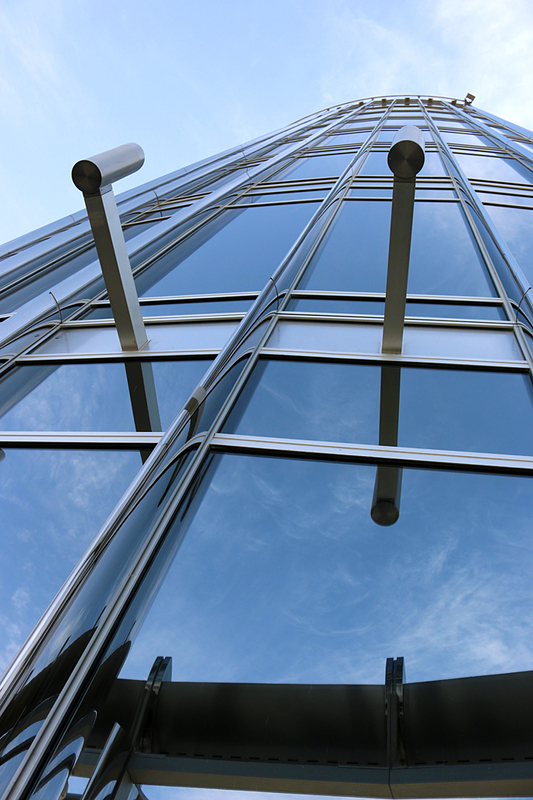 In your article about going to the top of the building in order to see the view, there is not one photo of the panorama from that height. You are correct, sszorin; and thank you for the reminder, as I intended to post some of the dozens of photographs of the views from the top. I apologize for not getting around to doing that in a timely manner. I still plan to do so in a future article.